iScore Sports has formed partnerships to complement and extend our technology. If you have a company or product that can integrate with or extend iScore's functionality, please feel free to contact us. SportsEngine is the top amateur sports league full service provider. Many offerings are available including website creation, design services, advertising services, content services, and consulting services. 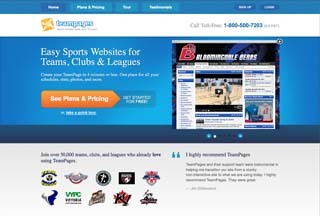 SportsEngine can provide everything you need for your amateur sports league to give it a professional feel. 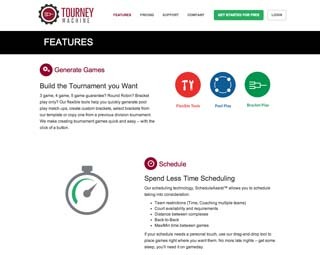 At Tourney Machine we're building a faster and more intuitive way to schedule and run your tournaments. We know that our platform connects you (the organizer) with thousands of parents, athletes, coaches, and fans and we take that role seriously. We're doing our job right when we're helping you take your tournaments to the next level--by empowering you to organize, manage, and communicate about your tournament, all from one simple tool. It doesn't matter if you're growing your tournament business, running an exposure event, pulling teams together to compete in a small, medium or large tournament or if you're running a tournament to raise money for your club or school--we're here to help you make it awesome. We believe that events shouldn't be defined by chaos, they should be remembered by the great moments and memories they create. PONY Baseball and Softball has selected iScore Baseball / Softball Scorekeeper as the official scoring product for their baseball and softball leagues. By partnering with iScore, PONY Baseball and Softball is bringing the leading mobile scoring platform to all of its participating teams. 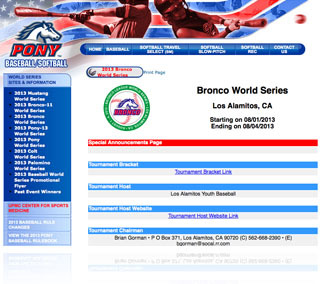 PONY began using iScore in some of its World Series events in 2012 and 2013, and will be using iScore for all PONY Baseball World Series events beginning in 2014. "PONY Baseball and Softball's Technology Committee chose iScore because of its ease of use and fantastic scoring and online reporting capabilities. PONY is very happy partnering with iScore and we look forward to recommend it to all our member organizations" said Brent Liberatore, Director of Information Technology for PONY Baseball and Softball. Keith Spencer, West Zone Region Director and 2013 Pony-13 World Series Tournament Director says "A must have for every upper level tournament. Real time game information for every fan unable to attend the game. Accurate, easy to use and reliable. Flawless at the 2012 Pony-13 World Series". PONY Baseball and Softball (http://www.pony.org) was founded in 1951, and has grown to be an international youth baseball and softball organization with over 28,000 teams and 4,000 leagues located in over 30 countries. The British Baseball Federation (BBF) is the national governing body of baseball within the United Kingdom, founded in 1987. 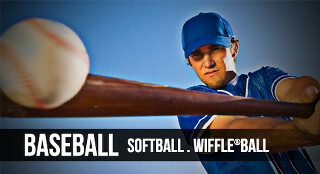 BBF is a federated member of both the Confederation of European Baseball and the International Baseball Federation. 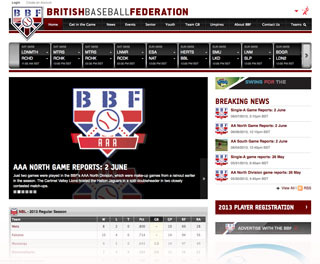 BBF is the joint owner (with the British Softball Federation) of BaseballSoftballUK (BSUK), the national development agency for both baseball and softball in Britain. See how BBF is using iScore to simplify their scorekeeping, broadcast their live scorecasts and upload their game data into the BBF system with one button press. Make it easy, make it safe. The goal of SportsSignup® is to take the hassle out of running a sports organization, no matter how small or large, and keep it easy and safe for all involved. They have done this for 10+ years by providing secure, easy-to-use online applications for online registration and fee payment processing; coach and volunteer background checks; tournament registration; broadcast communication with text messaging; and database-driven member management systems. Technically speaking, it's called Software-as-a-Service (SaaS). It's an approach that has helped thousands of sports organization's transform the way they do business and interact with their members. SportsSignup is a successful and trusted business founded by sports volunteers and staffed by sports enthusiasts, coaches, moms and dads. They were recently ranked on the Inc. 5000 list as one of America's Fastest Growing Private Companies and are a team in every sense of the word. Atomic Leagues is the top choice for baseball and softball teams that want to showcase their statistics on an affordable, user-friendly, and professional website that you can create in minutes. 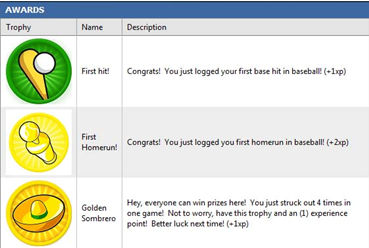 Capture your team's history through unlimited seasons and thrill your fans and players by letting them pore through detailed statistics including box scores, game logs, split stats, charts, team leaders, season statistics, career statistics, and record books - all updated on your website automatically after you score your games in iScore! Completely customize the look of your website to fit your team, add unlimited pages and photos, set up online registration, track player attendance, communicate to your players using email and text messages, and much, much more. Get started with Atomic Leagues today! 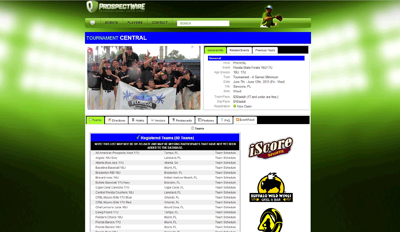 Prospect Wire is one of the leading hosts of amateur baseball events in the country. With a scouting database of over 25,000 players, it is also one of the largest scouting services to college coaches and MLB scouts in the U.S. Prospect Wire and the World Scout League host over 1,000 tournament and league games annually featuring some of the elite travel baseball programs in America. Based out of Florida, Prospect Wire organizes top-end events in Florida, Arizona, California, Georgia, Pennsylvania, Nevada, Virginia, Michigan, Illinois and Connecticut. 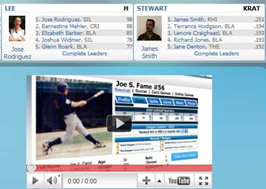 Prospect Wire and the World Scout League are proud to keep scores, stats, standings and league leaders with the iScore platform and fully integrate iScore into Prospectwire.com. StatFame does what the name implies: they make your stats famous. StatFame is not interested in the professional athlete; they cater to the amateur player. They are looking at the weekend warriors out there! They are looking at the kids that want to feel just like the big leaguers! If youíve got an interest in your sports statistics, StatFame has you covered. They are passionate about numbers, and their goal is to show your skills to the world. StatFame provides a method to aggregate, promote, share, and compare your stats - on top of that they do a DEEP sabermetric dive on your stats and show them to you from all angles to get the best out of your game! Want to track stats so that friends and family can follow along and earn badges/awards along the way? 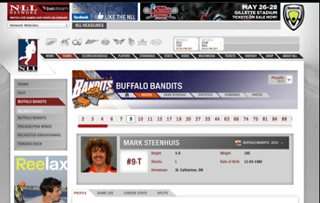 Want to track your child's career and have a virtual player card to show a college recruiter? StatFame can help you get that scholarship. StatFame will show your game from a whole new perspective with their sabermetric analysis engine. They will break your stats down and show things about your game that you may not know. Are you better in certain situations during the game? How about certain times of the day/year? StatFame will get down to the nitty-gritty and show you all that and more. Since 2000 Mid-America has been one of the top baseball tournament providers in the country. Founded for the elite amateur 18u teams to play against one another in D-1 venues, Mid America has evolved to host events for all levels of competitive summer teams from 14u-18u at college stadiums of all levels. 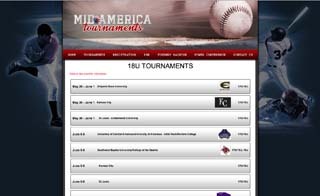 Mid America Tournaments has consistently been the tournament destination for some of the most successful baseball programs in the country. The Rawlings Prospects (MO), Racine Hitters (WI), East Cobb Yankees (GA), Midland Redskins. (OH), Midwest Nationals (MO), Austin Wings (TX), Wichita Reds (KS), Bayside Yankees (NY), Dallas Mustangs (TX), Building Champions (KS), and Indiana Bulls. (IN) are just a few of the powerhouse programs that play in our tournaments. Because of the quality of the teams we cater to, the professional scouts and college coaches consistantly attend Mid-America events. If you are a team looking to give your players the best opportunities to play at their highest possible level you must ask yourself two things: 1. Where are the best teams playing? 2. Where will the scouts and recruiters be? (Hint: they will always be where the top teams are playing). If you want to challenge your team and provide recruiting exposure for the players we would like you to consider playing in Mid-America Tournaments events. Create a professional looking website in just a few minutes. With TeamPages making updates to your website literally just takes seconds. No HTML knowledge needed. Everything is point and click, drag and drop simple. Customizing the look and feel of your website is as easy as a click of your mouse. Want a website that looks like the Pros? Easy. Simply add a custom banner and background to your website in seconds. Need help designing one? Just give us a call and one our skilled designers will create one for you. Have more information you want to post on your website? Create unlimited custom content pages and links, which are as easy as using Microsoft Word or copying and pasting in a link. Custom Pages and Links are a great way to post and organize additional information like: "About Us", "Contact Information", "Tournament Information" and "Staff Bios" on your TeamPage. 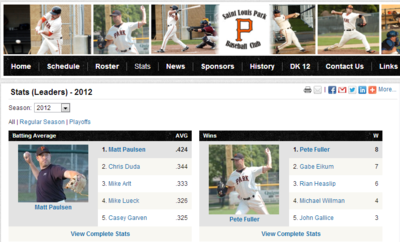 MyStatsOnline is giving you all necessary options to fully manage your league statistics at no charge. Some other features considered optional to manage your league statistics are also offered at very minimal cost.